$37.00 In stock. Order in the next 9 hours, 32 minutes and it will go out today! Your audience sees you place a single die inside of a clear container. Yet seconds later, the die explodes into eight tiny dice, or even changes color from white to red! All props can be passed for examination after you've performed this visually startling miracle. The inventor of this trick, Hiroshi Sawa has inspired magicians the world over with his whimsical and lyrical magic creations. A dentist by trade, Dr. Sawa has also appeared as a performer on countless Japanese and international television shows. Crash Dice (originally released as "Dice Bomb") has become an international best-selling trick thanks to its powerful impact and extremely easy method. 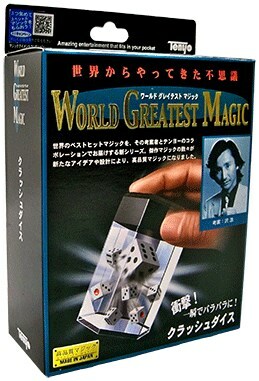 Unfortunately, many unauthorized copies of this trick are currently being sold throughout the world. Tenyo retains the exclusive worldwide sales rights to this creation, and we are proud to release this item with a brand-new addition to its methodology. Amaze yourself with the destructive power of Crash Dice!